The Aztecs had a polytheistic system of beliefs in which they worshiped multiple gods and goddesses. Since it was a military empire and new city-states and tribes were constantly brought into the fold of the empire, the gods and goddesses of these tribes and city-states were also included in the Aztec pantheon. While the most powerful positions in the Aztec pantheon were reserved for male gods, some of the Aztec goddesses also had considerable powers and their worship was a regular feature of Aztec life. A lot of gods and goddesses in the Aztec pantheon were actually inherited from the previous Mesoamerican civilizations, including the Toltec, Quetzalcoatl, and Tezcatlipoca, which were among the most important and powerful Aztec gods. Similarly, the Aztec Empire brought into its fold a lot of city-states and tribes after its founding in 1428 and different gods and goddesses of these tribes and city-states were also included in the Aztec pantheon. One of the most important Aztec goddesses was named Chalchiuhtlicue which literally means “she of the jade skirt”. Chalchiuhtlicue was the goddess of water, storms, and all the sources of water including oceans and rivers. Additionally, she was also the patroness of childbirth and a protector of women and children. Just many other Aztec gods and goddesses, she was also worshipped in regions outside the Aztec Empire and even before the Aztecs. Various ceremonies and rituals were reserved for this Aztec goddess, including the ritual of human sacrifice. Another important Aztec goddess was Itzpapalotl whose name literally means “obsidian butterfly”. She was a warrior goddess whose kingdom included the paradise world of Tamoanchan. According to Aztec mythology, it was the paradise where humans were created and where dead infants went. In artistic depictions, Itzpapalotl is often depicted with bat wings but she also appears with butterfly or eagle attributes. According to Aztec mythology, she was the mother of Aztec god of hunting and Milky Way, Mixcoatl. Aztecs had unique concepts of death and afterlife. According to Aztec beliefs, dead people dying of natural causes went to the underworld ruled by Mictlantecuhtli, the god of the underworld, and his wife, Mictecacihuati. As per the Aztec beliefs, she watched over the bones of the dead people and also presided over the ancient festival of the dead people. According to Aztec mythology, Mictecacihuati was sacrificed as an infant. Tlazolteotl, in Aztec mythology, was the goddess of purification, midwives, and steam baths. She was also the patroness of the adulterers and the goddess of filth and sexual misdeeds. But she also purified and forgave the sins and disease caused by misdeeds. Thus she was one of those Aztec deities who had a dual nature. 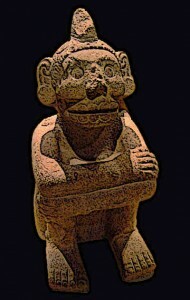 She was the mother of Aztec maize deity, Centeotl. In Aztec system of beliefs, it was Tlazolteotl who caused evil desires and it was also she who forgave and cleansed the dirt caused by the sin and misdeeds, in particular sexual misdeeds. Aztec celebrated the festival of “Ochpaniztli” in the honor of Tlazolteotl. This festival included the rituals of cleaning, sweeping, dancing, and other activities. Aztecs had multiple Aztec goddesses of motherhood and fertility. One important goddess among these was Cihuacoatl who was sometimes also known as Quilaztli. She was the patroness of the city of Culhuacan and, according to the Aztec mythology, helped the Aztec god Quetzalcoatl create the current human race by using the bones of the previous races. Her artistic depictions sometimes show her as a young women while at other times she is depicted as a skull-faced old woman holding the spears and shield of a warrior. Aztec Goddess Mayahuel The Aztec goddess associated with maguey plants was known as Mayahuel. 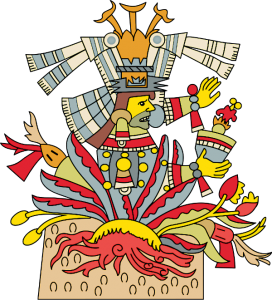 The Aztec goddess associated with maguey plants was known as Mayahuel. She was also worshipped by various tribes and cultures before the Aztecs and continued to be worship outside the Aztec Empire. She was also related to various fertility and maternal goddesses in the Aztec mythology and was thus associated with the concepts of fecundity and nourishment. In some artistic depictions, she is shown as having many breasts to feed her many children. 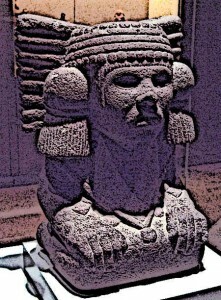 Aztecs had several matron goddesses, most important of which were Coatlicue, Chimalma, Xochitlicue, and Toci. Coatlicue was the Aztec goddess who was the mother of Aztec god of sun and war, Huitzilopochtli. In Aztec mythology, she also gave birth to the moon and stars. Chimalma, on the other hand, was the Aztec goddess who was the mother of Quetzacoatl, the god of knowledge, arts, merchants, winds, and various other things. As per the Aztec legends, she was also the spirit that accompanied the Aztecs from their original land of Aztlan. Toci was the goddess generally known among the Aztecs as the mother of gods and was also worshipped in cultures before the Aztecs. In artistic depictions, she is shown having black markings around the mouth and nose in addition to wearing a headdress with cotton spoons. Religious ceremonies and festivals were very common among the Aztecs and religious ceremonies took place at the end of every 20-day Aztec month. For instance, there was a ten day festival in the honor of Aztec goddess Huixtocihuatl at the end of which a woman was sacrificed in her honor. The festival held in the honor of Aztec goddess Tlazolteotl also marked the end of the harvest season and rituals of cleaning, sweeping, and dancing were included in this festival. Similarly, festivals and rituals, sometimes including humans sacrifice, were reserved for other Aztec goddesses as well. Aztecs had a polytheistic system of beliefs in which many gods and goddesses were worshiped. Some of these deities were taken over from other cultures and subjugated city-states and included in the Aztec pantheon. This included some of the most powerful gods and goddesses. It was common among the Aztecs to hold various festivals and ceremonies to honor Aztec goddesses and sometimes the rituals in these festivals also included human sacrifice in honor of the particular goddess for which the festival was held.